HighTouch: Can you Trojan Horse cultural change? Can you Trojan Horse cultural change? We all know the tale of the Trojan Horse. I was thinking of it again this week while listening to Byron Reeves (Total Engagement, Harvard Business Press, 2009) speak at a conference about the potential for gaming technologies to transform the work environment. Byron talked about the values baked-in to games that support the larger organizational trends toward greater transparency, openness, collaboration, and flatter more democratic work environments. I'm totally in the camp that says these technologies, when deployed in the right organizational setting, will be incredibly powerful and transformative. I'm left wondering, however, what happens when you introduce these tools into situations where they are at strong odds with an organization's predominant culture? 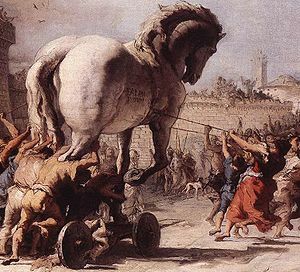 Do the trojan-horsed values have the power to change the culture? Or, are organizational cultures so strongly entrenched that they will eventually displace the values embedded in this new breed of software? We're headed for a classic battle once people begin to realize what's hidden inside that big wooden horse called code. I don't have a crystal ball, and I have no idea how it will play out. My gut tells me that most organizations will attempt to drive the embedded values out of the code. In the end, I suspect their attempts will fail, but it's going to be a long battle. Changing organizational cultures is a tricky business. Good post! Your thoughts and questions engage with humanity's moral dimension, rarely considered (though invisibly omni-present) as a component of either technological innovation or business practice. MLK said in 1967, "Let us realize the arc of the moral universe is long but it bends toward justice." Along that arc, enormous suffering, dislocation, backsliding, and many Black Swans. I appreciate your comments Peg! Thank you so much.